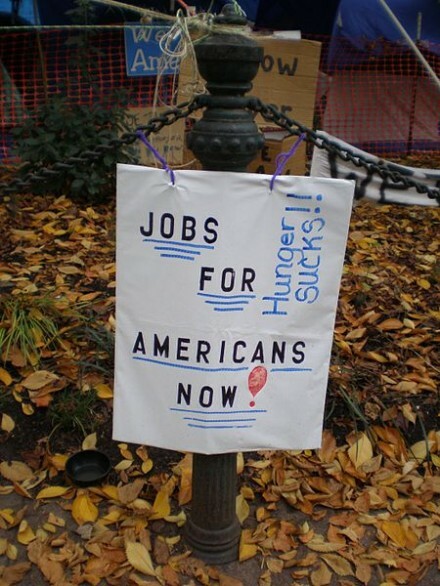 Did you know that a smaller percentage of Americans are working today than when the last recession supposedly ended? But you won’t hear about this on the mainstream news. Instead, the mainstream media obsesses over the highly politicized and highly manipulated “unemployment rate”. The media is buzzing about how “163,000 new jobs” were added in July but the unemployment rate went up to “8.254%“. Sadly, those numbers are quite misleading. According to the Bureau of Labor Statistics, in June 142,415,000 people had jobs in the United States. In July, that number declined to 142,220,000. That means that 195,000 fewer Americans were working in July than in June. But somehow that works out to “163,000 new jobs” in July. I am not exactly sure how they get that math to add up. Perhaps someone out there can explain it to me. Personally, I find that the “employment rate” gives a much clearer picture of what is actually going on in the economy. The employment to population ratio is a measure of the percentage of working age Americans that actually have jobs. When it goes up that is good. When it goes down, that is bad. In July, the employment to population ratio dropped from 58.6 percent to 58.4 percent. Overall, the percentage of working age Americans that have jobs has now been under 59 percent for 35 months in a row. 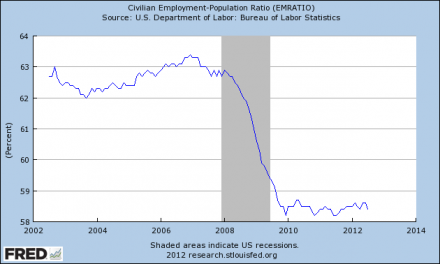 The following is a chart of the employment to population ratio in the United States over the past 10 years…. The gray shaded bar in the chart represents the last recession as defined by the Federal Reserve. As you can see, the percentage of working age Americans with a job dropped sharply from nearly 63 percent at the start of 2008 to a little above 59 percent when the recession ended. But the “employment rate” kept on dropping even further. It finally bottomed out at 58.2 percent in December of 2009. Since that time, it has stayed very steady. It has not fallen below 58 percent and it has not risen back above 59 percent. This is very odd, because after ever other recession since World War II this number has always bounced back strongly. But this has not happened this time. In essence, it is starting to look like 4 percent of the working age population of the United States has been removed from the workforce permanently. The good news in all of this is that things have at least not been getting any worse over the last couple of years. Even though things have been bad, at least we have had a period of relative stability. The bad news is that the employment rate has not rebounded despite unprecedented borrowing and spending by the federal government and despite reckless money printing by the Federal Reserve. Considering how desperately the federal government and the Federal Reserve have been trying to stimulate the economy, I truly did expect to see the employment rate bounce back at least a little bit by now. Unfortunately it has not and now the U.S. economy is rapidly heading for another recession. But Barack Obama is going to prance around over the next few days and talk about how wonderful it is that the economy created “163,000 new jobs” in July. What he isn’t going to talk about are the millions of Americans that have been unemployed for so long that they don’t even “count” in the official unemployment numbers anymore. But those people actually exist and they are really hurting. Many of them are starting to lose their unemployment benefits and they really do not know what they are going to do. 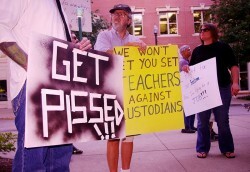 The following is from a recent USA Today article…. Since abruptly losing her $312 weekly unemployment check in June, Laurie Cullinan has depleted her savings, sought food from the Salvation Army and lit candles to save electricity. If she can’t find a job this month, the Royal Oak, Mich., resident worries she’ll be evicted from her apartment, an unthinkable prospect for the 52-year-old, who enjoyed a solidly middle-class lifestyle until she lost her office-manager job two years ago. Could you imagine having to face that? What would you do if you were about to be tossed out on to the street? When you add up all of the working age Americans without a job in the United States today, it comes to more than 100 million. Some people have accused me of lying about that figure, but it is actually true. There are more than 100 million working age Americans that are not employed right now. And even if you do have a job that does not mean that you are doing well. As I wrote about yesterday, only 24.6 percent of all jobs in the United States today are good jobs. The cost of living continues to rise much faster than wages are. Many families are having a really hard time just paying for the basics. The inflated standard of living that we have all enjoyed for so long is starting to disappear. An increasing number of young people are living with their parents well past the age of 18 because there are not enough good jobs and it is just so hard to make it in this economy. If you can believe it, 24 percent of all Americans in the 20 to 34 year old age bracket are living at home with their parents at this point. But we will be seeing a lot more of this as the economy gets even worse. “Multi-generational households” will become very common, and that is not necessarily a bad thing. Perhaps this will give some families a chance to do some bonding. Meanwhile, many of our once great cities continue to rot and decay at a staggering pace. Today, I saw one report that discussed how the city of Detroit has become a dumping ground for dead bodies. Detroit was once the envy of the world and now it is a place where murder victims are dumped. These are all indications of just how far we have fallen. But things are going to get a lot worse, so we should actually be thankful for the period of relative stability that we are enjoying right now. The long-term economic collapse that we are experiencing right now will soon accelerate. Eventually even the highly manipulated official “unemployment rate” will soar well up into the double digits. When it does, the anger and frustration that is boiling under the surface in this country is going to explode.